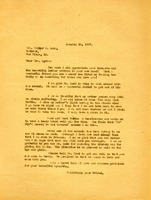 Florence J. Vaughn informs Martha Berry that Mrs. Ladd advises her to buy the rubber tile flooring. 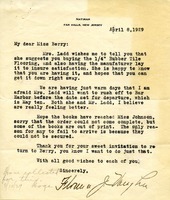 She also says that Mr. Ladd and Mrs. Ladd are well and that she hopes the books have reached Miss Johnson. 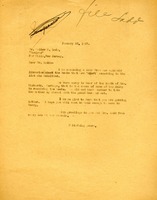 Florence J. Vaughn, assistant to Kate Macy Ladd, conveys Ladd's instruction regarding flooring. Vaughn also comments on Ladd's health and the weather. 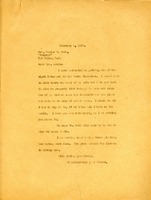 Enclosed with the letter is a contribution from Mr. V. Everit Macy for his half of a day endowed with Mr. and Mrs. Walter G. Ladd. 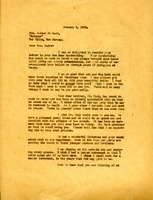 Martha Berry writes that she was delighted to receive a letter in Ladd's own handwriting and that she imagines Ladd's beautiful smile. Berry thanks Ladd for her friendship and contributions. She speaks of the library that they donated and boxes of candy that they sent to the students who in return sent them to their younger siblings. She wishes recovery and good health for Mr. Ladd. 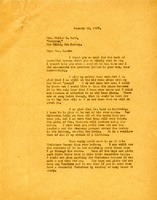 Letter to Mrs. Walter G. Ladd from Martha Berry concerning the interests, or land, around the Berry homestead. Miss Berry informs Mrs. Ladd that she has succeeded in getting six of the eight trusts surround the homestead and that she will try and get the other two but that her sister owns them and they might have to be sold at the public sale. Miss Berry knows that Mrs. Ladd is interested in the schools and is therefore writing her about it. Miss Berry also informs Mrs. Ladd that she hopes Mr. Ladd can come to visit the schools on his next visit south. 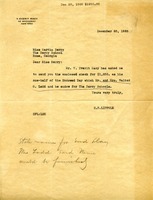 Letter asks Mr. Ladd about some missing books. 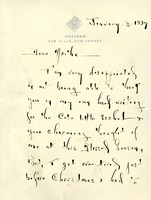 Ladd wishes her letter were in her own handwriting, but she has not been well and spent most of Christmas in bed, followed by the grippe at New Year's. Mr. Ladd continues to struggle with his injured leg. 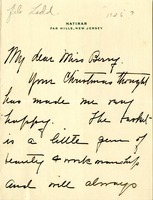 Hutch thanks Berry for the basket she received for Christmas and provides an update on the health of Kate Macy and Walter G. Ladd. 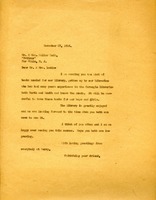 Martha writes to Mrs. Ladd sorry to hear about Mr. Ladd and his fall. She then gives an update on her own mother and how she is doing, as well as how the library building is doing in construction. Martha Berry accepts an invitation from Mrs. Ladd to visit her in Bar Harbor for a month that summer. 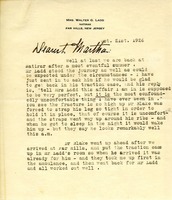 Martha expects to escape the heat of the Georgia summer, and she expresses her hope that Mr. Ladd will continue with his recovery. 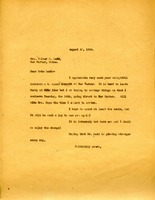 In this letter Kate Macy Ladd is describing her summer to Martha Berry. She explains how the doctor strapped her husbands broken leg all the up around his ribs, and that her health at the moment is in good condition.